This page will walk through Angular required validation example. Angular provides RequiredValidator directive for required validation. In template-driven form, HTML elements use required attribute for required validation and reactive form uses Validators.required with FormControl while creating FormGroup. In reactive form Validators.requiredTrue validates a control for true value and we commonly use it for required checkboxes. 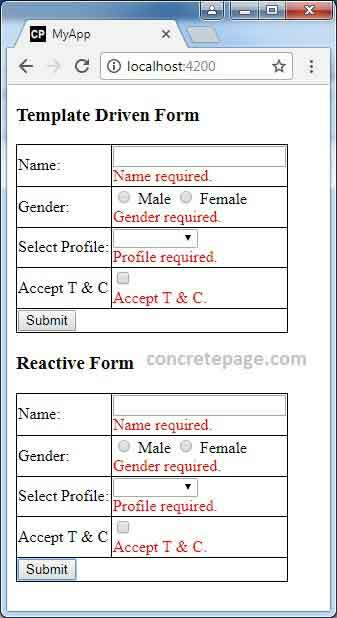 In our example we will use required validation for input text, radio button, checkbox, and select element. Angular 4 uses novalidate attribute by default in its form element at run time and hence while submitting form, HTML 5 validation will not work. If we are using Angular 2, we need to write novalidate attribute in our form element to use Angular form validation. In Angular 4 template-driven form we can use ngNoForm to enable HTML 5 validation. Here in our example we will provide demo for Template-driven form as well as Reactive form for Angular required validation. Now find the complete example step by step. Find the code snippet for required validation in input text box. We need to use required attribute in text input. Now we will use required and minlength validations together. Find the error messages using errors as following. For required validation in reactive form we need to use Validators.required with FormControl while creating FormGroup. In HTML template we will create text input as following. For validation error message, first we need to create a getter as following. Then show validation error message as following. Now we will use Validators.required with Validators.minLength. To show separate validation error messages, we will use errors which is defined in FormGroup as following. For required validation in reactive form, we can also use required attribute with formControlName as following. Find the code snippet for required validation in radio button. Find the code snippet for required validation in select element. Find the code snippet for required validation in checkbox. In reactive form Validators.requiredTrue validates a control for true value. We commonly use it for required checkboxes. Find the print screen of the output. When we click on submit button without filling the form, we will get following output.